Amazon (s AMZN) introduced a brand new range of Kindle Fire tablet devices late on Tuesday that are powered by faster 2.2 GHz processors and are much lighter compared to previous versions. The company said these devices also are “enterprise ready” and support encryption. The new devices come with a new type of display that Amazon is calling HDX, or a better than high-definition display. Amazon claimed that these devices have 11 hours of battery life and can be used for 17 hours for reading purposes. 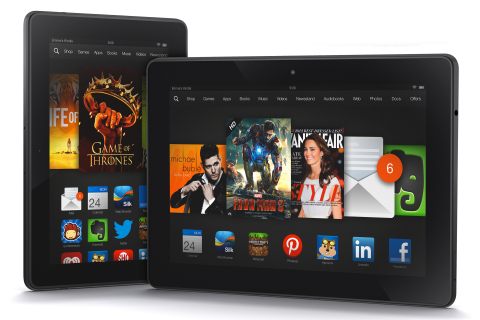 The new tablets uses the latest version of FireOS (3.0 Mojito), a variation of Android OS. The 7 inch Kindle is going to cost $229 and 8.9 inch version costs $379. The smaller version will start shipping on November 14 while the larger device is available for pre-order and will ship on December 10. The company also introduced a new cheaper Kindle Fire HD version for $139. Hey Om, what’s with all of the “Tweet This” links by all of the bullet points from Amazon’s press release?